Another day, another MMORPG, another press event. It’s getting hard to keep track of the sheer volume of games coming out these days, but we’re on top of it! 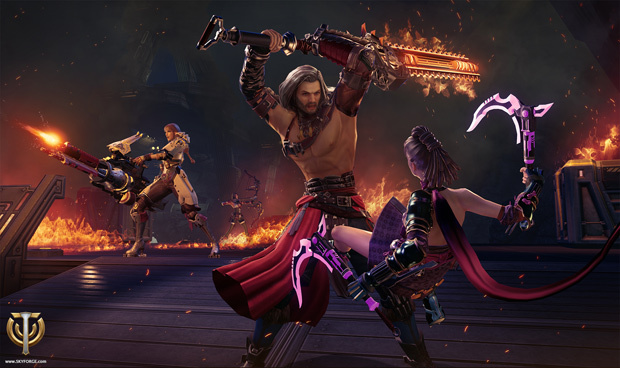 Skyforge is one such game, and it comes straight out of the creative efforts of Obsidian Entertainment – you know the guys. They’re the ones who have pretty darn good writers and do generally well-received work on single-player MMORPGs. I was surprised to hear about their involvement in Skyforge, but as the press event went on, I could see that their influence on the game was a positive one. 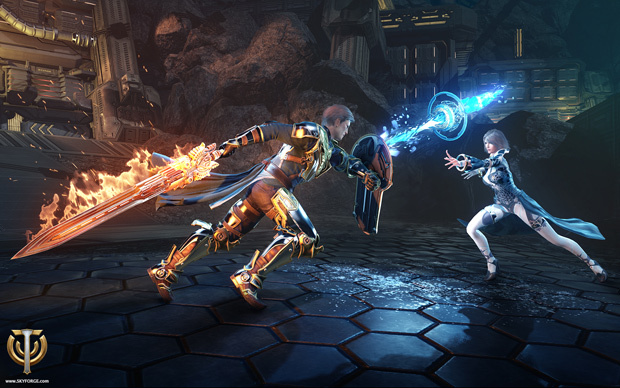 Skyforge is intended to be a full-featured MMORPG, with PVE, PVP, crafting, exploring, etc. Everything you could possibly want. It’s going to have ground-targeting combat that’s frenetic and active compared to the lethargy of old-school titles like WoW. Think Wildstar, but without the bright disco ball effects on the ground constantly. 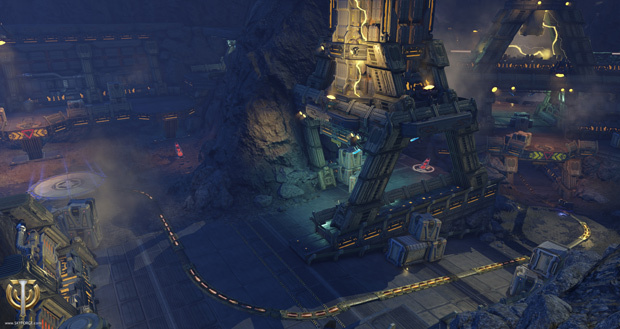 What sets Skyforge apart, however, is the games concept. You play as an ascendant god. You manage followers and your own faith. You can also swap classes at any time out of combat, and even better, you get to have a God Form, which can be used as a sort of ultimate ability at certain strategic moments. It is not just some piddly little cooldown ability – you will wreck everyone and everything in God form. Naturally, these sorts of features make PVP interesting. Don’t worry too much about the class swapping – while everyone can do it, you still have to invest your progression points into specific classes to fully flesh them out. But the class swapping makes it so that, with investment, players can be quite versatile without the tedium of alt-making or alt-swapping. And this is a small detail, but I found the sci-fi nature of the setting especially compelling. These aren’t historic gods you’re playing as, these are far-future, highly evolved humans becoming gods through a merging with technology and the mysteries of the cosmos. At least, that’s what the art leads me to believe. If it’s true, then thumbs-up from me. The inclusion of a God Form in Skyfroge necessarily makes what would be classic PVP matches rather unusual. Small matches, like capture the flag (which is 12v12) or anything else (which is 8v8) are made intriguing by the coordination of teams not just in terms of everday tactics or movements, but also in the overall strategy regarding the use of God Form, which I was lead to believe can only be utilized once per player per match. Will everyone shift all at once and crush the enemy in the first round? Or will players use their form more judiciously and defensively? Blitzkrieg, or wait and see? It’s up to individuals and teams to decide. The design philosophy behind the game, despite these interesting features, is fairly traditional. 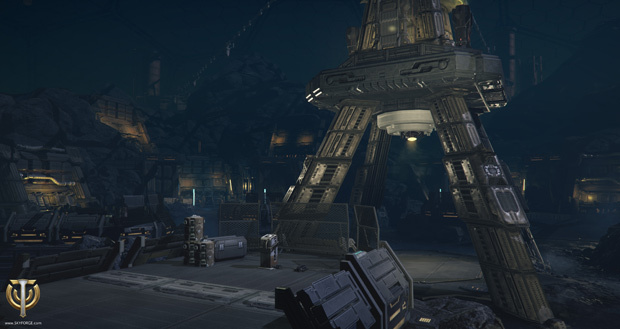 The developers are confident that they can balance fun factor between PVP and PVE. They’re designing a matchmaking system that lines players up according to their gear and progression level, so that individuals are automatically squaring off against those of a similar level and time investment into the game. Gear is being addressed. Balance is a big deal. But what of the concern that PVP balancing concerns necessarily neuter the excitement of PVE? Purely PVE games, after all, are able to have far more dramatic, impactful, and generally epic abilities in combat because of the lack of PVP balancing concerns. Bigger percentages can be used. ‘Breaking the game’ is still a concern, but less so, because NPC mobs don’t burn down the forums in rage or quit the game when they’re anticlimactically slaughtered. The devs of Skyforge believe that they, like The Old Republic, like World of Warcraft, like so many others before them, can still make the game fun and balanced for both features. Personally I think a game wherein you play as a nascent god requires a little oomph and insanity in the combat, so much so that PVP would necessarily be swift, brutal, and at times unfair – but I’m not a game designer. Maybe it will work out great. What I can say for certain is that the developers of Skyforge display a noticeable professionalism and acumen when it comes to their craft. They take the game quite seriously, and have clearly thought-out all possible issues, scenarios, and challenges facing them in this highly competitive, highly fickle online gaming market. The theme alone sets their game apart from other full-featured MMORPGs, and it will be interesting to see how things develop once the game enters into its beta phase. That beta is still a ways off, and has yet to be announced. 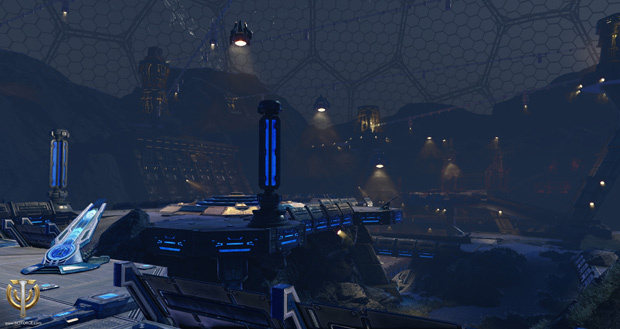 Stay tuned for more on Skyforge in the near future.